As many of you are aware, I have been working on a follow-up book on the Philadelphia campaign. Well, I have signed the contract and the manuscript is due to the publisher this May. The new book is being scheduled for a Spring 2020 release. Needless to say, every extra minute right now is being devoted to finishing the manuscript. This book starts where my Brandywine book ends. After a review/summary of the first book, this one will cover the Battle of the Clouds, Paoli, the occupation of Philadelphia, the early fighting along the Delaware River, and several chapters on the Battle of Germantown. I hope you all are looking as forward to this as I am to finishing it. February 18: 12:30: I will be speaking to the NJ Society of the Sons of the American Revolution in Trenton, NJ. March 7: 9am: I will be taking part in a panel discussion at the Ephrata Cloister in Ephrata, PA.
April 4: 7pm: I will be speaking for the West Goshen Historical Commission at the West Goshen Township Building outside West Chester, PA.
May 14: 7:15pm. I will be speaking for the American Revolution Roundtable of South Jersey somewhere at the Burlington County Lyceum for History and Natural Sciences in Mt. Holly, NJ. I have been contacted about the possibility that the 3rd Virginia was not the regiment that fought in the cemetery at Birmingham Meetinghouse. While I am still doing some digging on this issue, the research has led to two new sources on the Battle of Brandywine regarding the 3rd Virginia so I thought I would share them with you. Fame will have informed you by this Time that we have had a Battle—Tho unfortunate, it will, by no means, be so ruinous as Report & the Tongues of Tories will make it. We were repulsed & lost the Ground but our Enemy purchased it dearly. Their loss is very considerable by all accts. Ours not so great as might be expected. In my next I shall be able to inform you more particularly. Our Regt. suffered more than any in the Line & acquired greater Glory. We lost upwards of 40 men Killed & wounded. Three officers are killed & 4 wounded, one, I fear, mortally. The Officers of ours killed are Capt. [John] Chilton, Lieuts. Apollos Cooper, Bob [Robert] Peyton. Lieut. [William] White shot thro the Belly. Capt. [Rueben] Briscoe, Lieut. [John] Mercer & Capt. [Philip] Lee are slightly wounded. Well, my school year is finally over and I have finally had some time to decompress and work on my Germantown manuscript. My family and I just returned from a trip to New England. Believe it or not, we tried to steer clear of any heavy Colonial history stops with the exception of visiting John Adams’s house. We focused on other things on this trip including several days out on Cape Cod. That said, we took a day trip to New Bedford to see the whaling museum. Now for those of you that don’t know, I wrote my undergraduate thesis on the evolution (architecturally) of the coastal defense fortifications in the Delaware River Valley. I grew up about a mile from the Red Bank battlefield and Fort Mercer and I have always had a love for forts of any type. My grandfather even spent time serving on the Nike missile bases around Philadelphia in the 1960s. So, whenever I have a chance to visit a fort, I usually take the opportunity. While at the whaling museum, I found a brochure for Fort Talbot which was located at the mouth of the New Haven harbor. So we took a drive over there. Unfortunately, the fort was closed and deemed unsafe for visitors by the city. It was a brick casemated fort similar to a Fort Sumter or Fort Delaware but smaller. There is a small museum near the fort that we went in. Most of the artifacts (and there were many) had to do with local veterans and their service to the country from WWI through the conflict in Iraq. There was a Civil War section with some history about the fort as well. However, the reason I bring all this up has to do with Brandywine. No matter how much I try to steer clear of thinking about the battle, there was a very small Revolutionary War section in the museum. 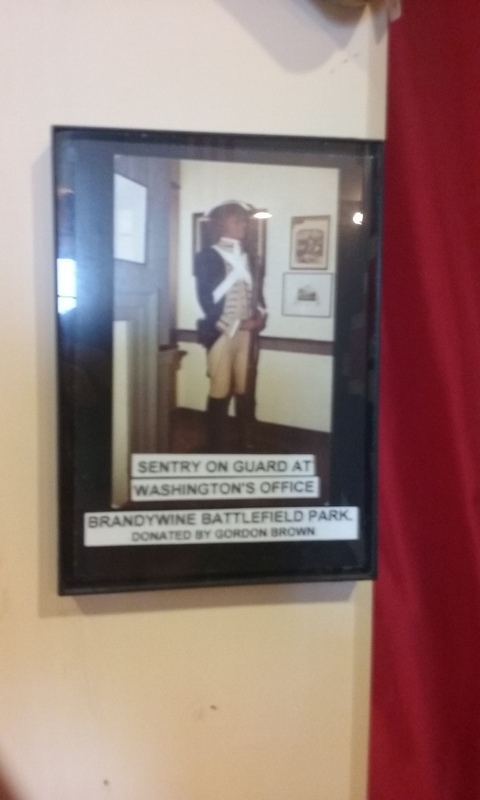 Included in the area was a small photo someone took inside Washington’s headquarters at Brandywine many years ago showing one of the infamous mannequins that were once on display. I had to take a snap of it with my phone and share it with you all. I had another Brandywine run-in towards the end of our trip. We decided to break up the drive home by spending a day at Hyde Park on the Hudson River and visit the Roosevelt sites. My wife and I had been there way back when we were first dating, but this was our first time back since then. A new feature they offer at FDR’s house is a shuttle ride to “Top Cottage,” the small stone building he had built on the far end of his property to escape his daily stresses. We took the ride up there with another family and had a very nice tour and discussion with the tour guide on the porch. On the way back to the visitor center in the shuttle, we got to talking to other family. To make a long story short, it came up that my wife I have experience working in the museum field and that I had once worked at Brandywine. The family (from Bucks County, Pennsylvania), asked me if I had wrote the book on Brandywine. When I said yes, the husband said he read it and enjoyed it. Small world. Even when I try to avoid Brandywine, it just keeps on finding me. September 22: 12:00 I will be speaking at the Cloud Family Reunion at the Mendenhall Inn in Mendenhall, PA.
November 10: 11am I will be speaking to the DAR in Philadelphia, PA.
May 14: Time and location TBD. I will be speaking for the American Revolution Roundtable of South Jersey somewhere in Camden County, NJ. Due to a lack of interest, my scheduled tour for next Saturday is cancelled. I will likely not be scheduling any more of this publicly available tours. In the future, if you would like a tour of the Brandywine Battlefield, please contact me to discuss arranging a private tour.